Over the years, the LEGO brick has moved from just a child’s plaything to an artistic medium. Like with other mediums, artist explore different aspects, including the darker ones that aren’t necessarily as wholesome as one would expect to find in children’s toys. 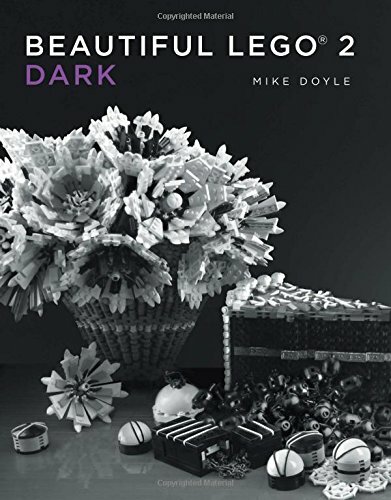 With the new No Starch book, Beautiful LEGO 2: Dark, Mike Doyle explores some of the darker ideas that people have brought forth using LEGO pieces. Beautiful LEGO 2: Dark is separated into 36 chapters, mixing chapters of explorations of topics and chapters dedicated to individual artists. Looking at such diverse objects as inspects, zombies, space creatures, and other things that go bump in the night, the things of nightmares are brought forth in their abs plastic glory. The photography brings out the horror and fantasy elements, and often creative lighting gives the edge of darkness to the haunted houses, dragons, and other LEGO creations. While all of the LEGO creations in the book are beautiful, it’s worth noting that the book is strictly pictures. With the exception of the preface and the single builder chapters (wherein the builder writes a little about their work and their inspirations), the book is devoid of words beyond the names and artists of the sculptures. It’s great to look at for inspirations of things to build and to see the creativity of the builders, but there are no instructions or tips on how to build. The creations in Beautiful LEGO 2: Dark truly are beautiful to look at and give a good look at the more shadowy creations that people have been inspired to make. From a more personal perspective, it was also cool to see some of the things friends have made and things I have seen in person at LEGO conventions and exhibitions in the book, giving them a new perspective thanks to the photography.